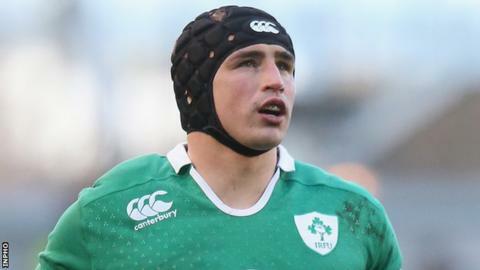 Ireland flanker Tommy O'Donnell's hopes of playing in the World Cup appear in doubt after he was injured in the 35-21 warm-up win over Wales on Saturday. Joe Schmidt's side had enjoyed a hugely positive afternoon after scoring five tries before they suffered the late blow as O'Donnell was stretchered off. The Irish coach later said O'Donnell had "hurt his hip" although the precise nature of the injury remained unclear. "Tommy's gone to hospital to get a scan," added Schmidt. Ireland start their World Cup campaign against Canada in Cardiff on 19 September and O'Donnell, 28, may now face a race against time to be fit for the tournament. "At the moment we know he's hurt his hip but we don't know what the injury is and we'll know more about that in the next 24 to 48 hours. "The frustrating thing for Tommy is that he made 14 or 15 tackles, he got at least three, maybe four or five turnovers. "I thought he started the game really strongly and he's such a dynamic player for us that we're just going to cross our fingers and wait and see to be honest." O'Donnell's injury may open the door to Chris Henry's inclusion in the Ireland's 31-man squad for the tournament alongside other back row players Jamie Heaslip, Peter O'Mahony, Sean O'Brien and Jordi Murphy. Andrew Trimble, in his first Irish game in 14 months, went off in the first half but Schmidt said that the Ulster wing had sustained a "mild foot sprain" which does not appear serious. Munster flanker O'Donnell fell awkwardly as he attempted to drive for the Wales line in the 75th minute and he used an oxygen mask before being transferred on to a stretcher. Captain Jamie Heaslip, Darren Cave and man of the match Keith Earls scored Ireland's first-half tries with Munster pair Simon Zebo and Felix Jones crossing the Wales line in the second half. Schmidt praised the display of Earls and Donnacha Ryan as the Munster duo made their return to international duty after absences of more than two years. "Keith Earls got player of the match but Tommy (O'Donnell) did well and Donnacha Ryan got through a massive amount of work," said Schmidt. "Donnacha bosses the line-out really well for us, we're delighted he finally got onto the pitch for us." Schmidt is expected to trim his squad to 38 players next weekend before announcing his final 31-man squad later this month. The Ireland coach insisted that anyone culled from the squad next week will not have their World Cup hopes entirely dashed, with provincial matches in two weeks' time likely to be further auditions. "If they don't fit into getting an opportunity with us we'll still get to see them in those games," added Schmidt.